This article includes an overview of internal consulting and a look at how internal consultants support change management. The first part is written by Dr. William Trotter, previous managing director of the Association of Internal Management Consultants, and looks at the role of internal consultants. The second part is written by Tim Creasey, Prosci's Chief Development Officer, focusing on the role of internal consultants in supporting effective change management implementation. Supporting internal clients in a shared service type organization, such as Human Resources, Training & Development, Information Technology, Finance, Quality Management, Health, Safety & Environmental Services, Competitive/Business Intelligence and Planning, etc. My experience is that of the total number of people in a company performing this function, there are only a small portion of them in formal internal consulting groups. Many formal IC groups have a combination of employees from various areas of the organization, either on a permanent or rotational basis, and external consultants hired into the group to bring their expertise and knowledge of how to provide the services needed. While some organizations do have formal internal consulting groups, there are many people fulfilling the role without the title. These individuals are often in HR, OD/OE, or Project Management Offices. Regardless of organizational affiliation, those performing internal consulting type services need core consulting skills, which the AIMC helps to develop. Internal consultants need a combination of company/industry knowledge and core consulting skills. It is also helpful to have additional expertise in one or more key practice areas such as strategic/business planning and performance measurement, process management (including quality management and Six Sigma) or organizational effectiveness/development. It is also important to understand the essential dynamics of managing a consulting type of organization. The AIMC has developed a number of tools/frameworks to help organizations better manage IC services. The first is the IC Operations Model which provides key insights in the areas of: client relationship management, operating processes such as contracting, culture and people including staffing and development. This is linked to the IC Performance Measurement (Balanced Scorecard) System which provides key measurements in the financial, internal process, customer and innovation/learning areas to help ensure a balanced results focus. The next tool is the IC Competency Model. This has competencies for both individual contributors and IC leaders/managers, which will be linked to skill-building programs. Internal consulting has grown in part because organizations are trying to get more value from their overall “consulting spend.” This includes focusing more on implementation and continuous improvement in addition to more effectively transferring technology from external consultants to the organization. ICs are also often involved in negotiating external consulting contracts, teaming with external consultants on large projects and maintaining a roster of qualified consulting suppliers who can supplement their services in times of heavy or specialized demand. One of the rapidly evolving growth areas in internal consulting is enterprise change management. Here, ICs are working with top levels in the organization to implement a consistent change methodology and build it into various activities throughout the firm, such as project management. Internal consultants play an important role in managing the people side of change by applying structured change management tools and processes. Below are the two simplest and most common team structures for change management. 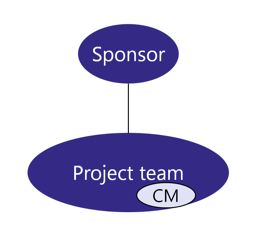 Team structure 1 shows an existing member or group from the project team taking on the change management activities. 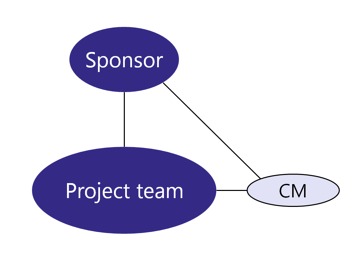 Team structure 2 is the use of internal consultants, whether or not they have the title "internal consultant," to support a project team and sponsor on the change management front. Many internal consultants attend Prosci's change management certification program. These consultants tend to serve in a support role on projects in the organization, developing and delivering change management strategy and plans to internal clients. Many times these individuals are formally HR consultants, communication specialists, OD consultants or are part of the Project Management Office or a separate strategy or transformation staff. In some cases, organizations are formalizing the role of the Change Management Office or the change management consultant. While the change management specialist has a full understanding of change management, what it means and what it looks like, many in the organization may not have the same perspective. For example, some might think change management is just communication. Others might think it is version control for IT hardware and software. Those with a background in project management might think it is the steps to follow when there is a change to project scope. Still others might think it is just holding a group therapy session where people can vent. With Team Structure 2 from above, the internal consultants who support the project team are responsible for developing the change management strategy and plans. These activities are not done in a vacuum. The consultants must solicit input from the project team, the sponsor, impacted leaders and managers, and supervisors throughout the organization. For instance, when conducting change management readiness assessments, the internal consultant might interview a business leader from each impacted group in the organization. However, it is ultimately the internal consultant who captures and delivers the strategy and the subsequent plans. The action steps contained in each give the internal consultant guidelines on how to develop and present the strategy and plans. The change management methodology overview provides a high-level description of the methodology. First, employees want to hear from someone at the top of the organization about the business reasons for the change, e.g. why it is happening, what are the risks of not changing, why the change is happening now. Second, employees want to hear from their direct supervisors about the personal impacts of the change, including how it will change impact to their day-to-day work. Employees do not want to hear from HR, a communications specialist, the project leader or the change management consultant. They want to hear from someone at the top and the person they report to. 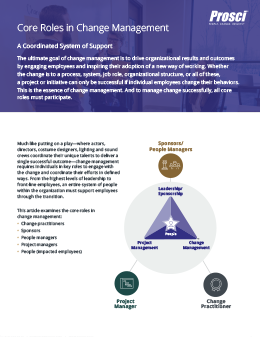 The role of the change management resource is to enable the preferred senders (senior business leader and managers/supervisors) to deliver these messages. They can segment the audience, create talking points, build presentations and even schedule communication events, but the messages should be delivered by the preferred sender.